Does it seem like things are moving faster these days? They ARE! The mediascape is changing. Is radio listening? More importantly, do broadcasters really UNDERSTAND when, why and how consumers are using branded media content — or are you among those stuck on the treadmill of “we’ve always/never done it that way” thinking? Few media brand managers have the time and management support to effectively track the latest methods to break through today’s communications clutter. Even fewer have the tools, staffing and resources to really compete in our evolving 360 degree ‘Mediamorphosis’. As an industry, we’ve been challenged to deliver so much with so little for so long that the thought of tackling more distribution channels is the LAST thing on most to-do lists. Yet, your consumers are there. Can you afford NOT to be? The objectives are simple. But not easy. However, there is ONE ‘secret weapon’ which I will share with you that you can implement TODAY to improve your branding while making life LOTS easier! The GOOD news: every OTHER industry faces the same challenges. The BAD news: For some reason, radio is clinging past practices and outdated ‘group think’ more than most. There is, however, one great equalizer that separates winners from losers and leaders from followers. That Equalizer is TIME. Each of us has just 24 hours each day. The question is how well we maximize this precious commodity. GM is a brand. But they also HAVE subordinate brands like Cadillac, GMC, Buick and Chevrolet. GM also has other brands like dealer groups, individual dealers, financing and branded ‘original’ parts. The dealer has any number of other brands, which may include service, individual sales staff, an icon representative (like KFC has the Colonel), and others. Add in all the OTHER automakers, and it’s easy to see how a strategy to manage all these brands is critical. 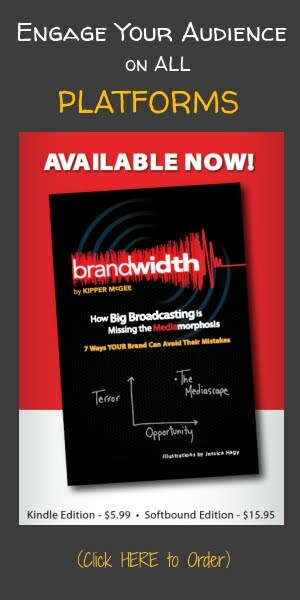 In radio, most brand managers deal with more than one station -- often in more than one market. While each station brand should have an overall “Marketing Model”, so should the various subordinate brands like personalities, benchmark features, major on-air promotions, event marketing and online platforms. Remembering that we are all bound by ‘The Great Equalizer” of time, it is critical that there is a master plan of how all these pieces fit together, and which ones get what level of priority. The military uses the term “triage”, to determine which battlefield cases can be saved, which can’t, and which can be back-burnered until later. The more you have a ‘triage plan’ in place, the less time is wasted reinventing the same wheels. Ironically, the more you have the predictable basics mapped out, the more flexible your time is when some urgent or hot opportunity arises! Once you have put together your Brand Portfolio Strategy, the next question is “how”? Remember: as a brand manager, your job is not to DO everything, but to make sure that IT GETS DONE! ● Staffing. You may have a receptionist who’s a social media maven, or an air talent with mad production skills. Pc may be creating an opportunity of a lifetime simply by assessing who can do what, and where their talents and desires may be hiding! ● Cluster/Group Dynamics. Old-school managers tend to think in a linear fashion. If station “A” has an emerging Photoshop Rembrandt on-air, perhaps that person can create online graphics for stations “B” or “C”. Also, great talent no longer need be limited to one market or cluster. ● Use the tools you have. There are many great free resources for sharing information on a budget. Google Drive and Evernote are just two of many. In my programming career, I’ve had the good fortune of working with a variety or startups, turnarounds and heritage stations. One trick: regardless of format, I always used music scheduling software like MusicMaster to schedule promos and production elements — as well as the music. This technique works with spoken word formats, too. Scheduling promos helped return WDBO/Orlando to #1 overall (and in all key demos)while helping WLS-AM/Chicago beat longstanding leader WGN (and the Cubs! )in all dayparts and demos under 65. There are also ways this can be used to enhance social media posts driving consumers to the distribution platform of your choice. Especially handy in PPM and Diary markets, if played right. 24 Hours a day times 7 days a week = 672 Quarter Hours. Make sure YOU make the most of each one -- and you'll stay on top!